This recipe was originally published on September 18, 2016 and republished on September 26, 2018 with improvements to the recipe, updated content and a video. About a decade ago, I had a conversation with a colleague of mine who enlightened me on the subject of fruit butters. 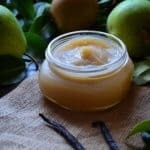 I started with this Easy Homemade Spiced Apple Butter, and this Crock pot Vanilla Pear Butter Recipe was the natural next step! I just recently published this recipe for Plum Butter which tastes out of this world! What exactly is a fruit butter? A fruit butter is a highly concentrated form of pureed fruit (apple, pear, plum, etc…). It has a smooth consistency and silky texture, which can easily be spread, like butter. Spices are often used to highlight the fruity taste and they are usually made without any pectin. How is a fruit butter made? Fruit butter is simply made by chopping fruit into chunks and cooking it so that it softens. It is then pureed and cooked again until all the moisture has evaporated and transformed into a smooth, silky fruit spread. Fruits butters can easily be made in a slow cooker. I have previously mentioned that I have a wonderful pear tree growing in my backyard that was planted by my dad. It truly is a privilege to watch the May blossoms slowly develop into actual pears. 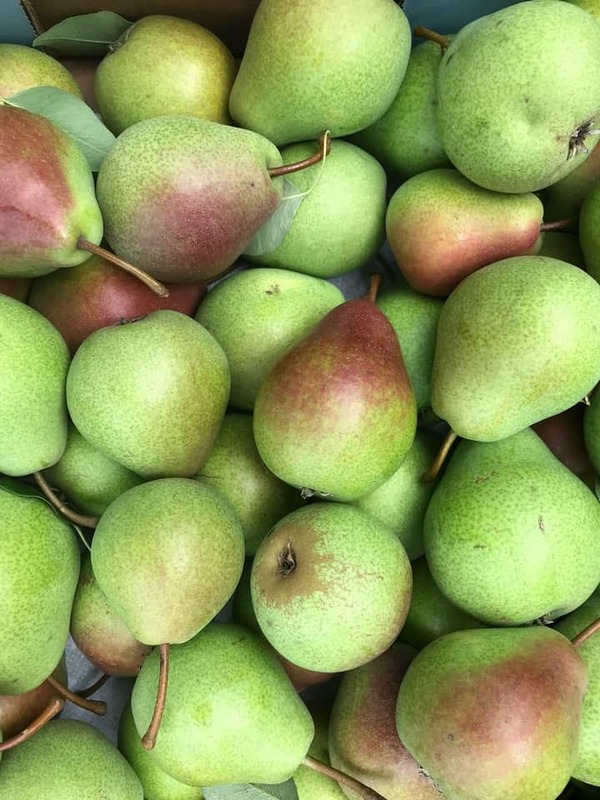 A recent weather warning of thunderstorms and risk of high winds left us no choice but to go pear picking in our own backyard – we didn’t want to end up with pears splattered everywhere, blown around by the wind! So we picked the pears… about 40 pounds worth! That’s the thing with fruit trees – the fruit ripens all at the same time, and then you are left scrambling, trying to find ways to use or preserve it for the long winter months. 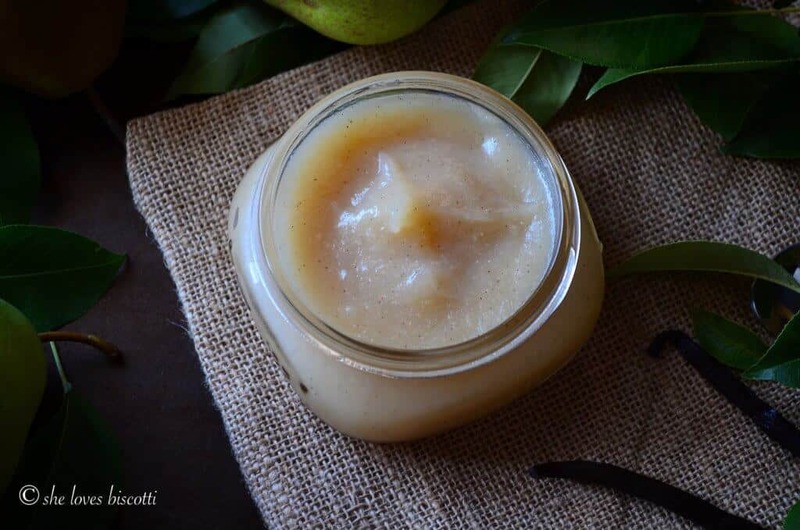 So if you are wondering how to preserve pears, I have the perfect solution… make this perfectly spiced pear butter! It really is so easy to make in a crockpot! The first thing we are going to do is give the pears a good rinse. Once that is done, we need to peel and core the pears. Feel free to use a variety of pears for this recipe. Pro Tip: Use a melon baller to remove the core of the pear. Next, we need to add the peeled and cored pears to the slow cooker along with a scraped vanilla been, some orange peel, a few tablespoons of brown sugar, orange juice and a little bit of water. Pro Tip: The water is added to prevent the pears from scorching so it is important not to skip this addition. Set your crock pot on high and cook for 3-4 hours. The total time will depend on the ripeness and the type of pears. 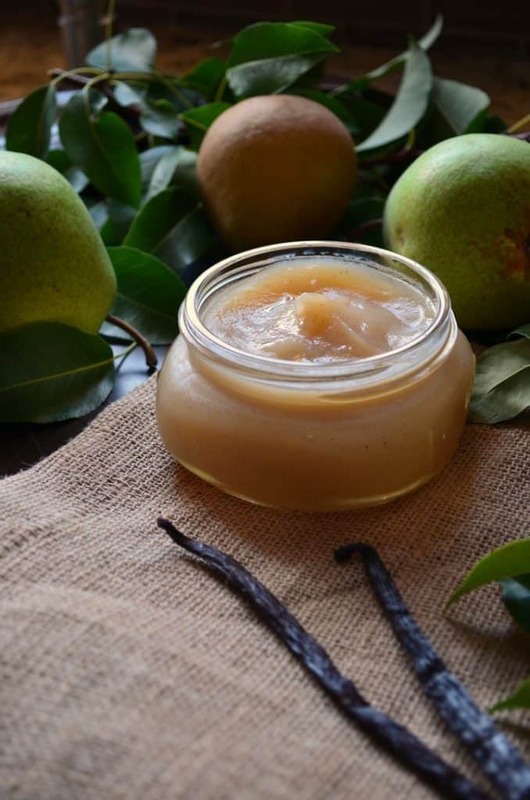 As soon as the pears have softened enough to be pureed, remove the vanilla bean and the orange peel. With a hand help immersion blender, process the pears until smooth. You will notice that this is a very wet mixture. Alternatively, the cooked pears can be transferred to a food processor and pureed. The only thing left to do is to cook it down until there is no liquid that seeps out when a teaspoon of the fruit puree is placed on a dish. Nutrition Note: This pear butter can be a great fat-free alternative for butter. But remember, fat free does not mean calorie free. Moderation is key! As I was looking for some fruit butter inspiration, I was surprised to see that some recipes actually had up to 4 cups of sugar added to 4-5 pounds of pear. I think that would be appropriate for a jam or jelly, but for a fruit butter? I’ll let you decide. It’s definitely to sweet for me. I opted for just a couple of tablespoons of brown sugar, due to the fact that my pears were not yet fully ripened. My daughter-in-law and daughter are just as obsessed as I am when it comes to fruit butters. And so they became my taste testers for this recipe. After some tweaking, we decided to simply enhance the flavor of the pears with some vanilla bean and just a hint of orange. Just in case you are wondering, we tried adding different “warm” spices to the pears (cinnamon, nutmeg and allspice). As you probably know, spices have the wonderful ability to complement and add a little bit of depth to the fruit. We felt the delicate flavor of the pear was overpowered by the spices, despite the fact that we used very little amounts. We then attempted a lemon and vanilla bean pear butter, followed by an orange and vanilla bean pear butter. 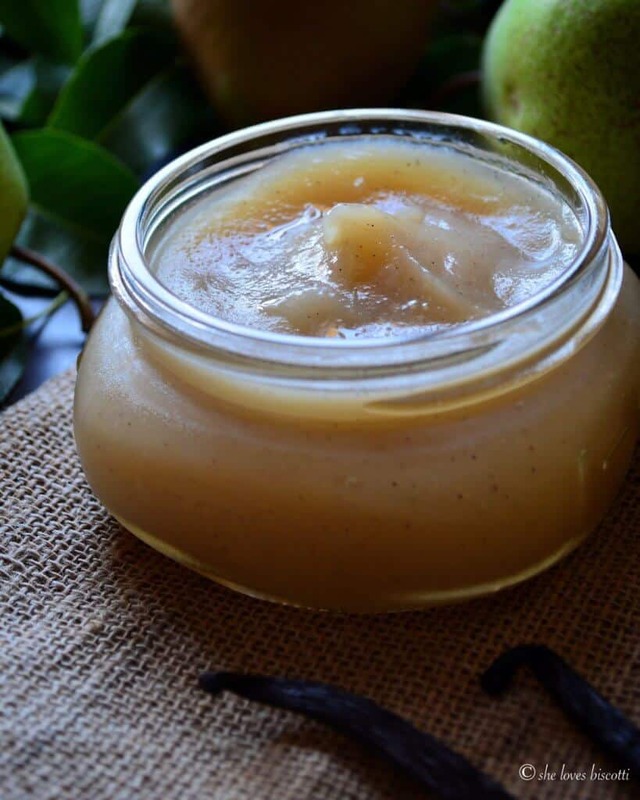 Ultimately, we decided that this Crock pot Vanilla Pear Butter Recipe was best with the hint of orange. The inspiration for this pear butter came from a recipe found on this site. 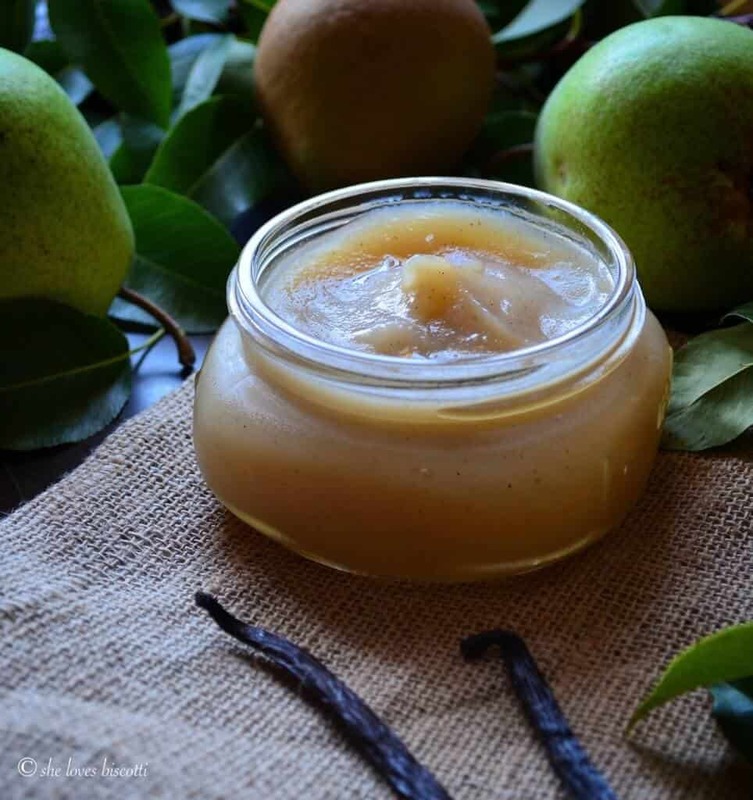 This Crock pot Vanilla Pear Butter Recipe is one of the best ways to preserve an abundance of pears. Not to mention they make the perfect hostess gifts. ★★★★★ If you have made this Pear Butter recipe, I would love to hear about it in the comments below and be sure to rate the recipe! Cover and cook on the high setting for about 3 -4 hours (Total time will vary based on ripeness of pear). 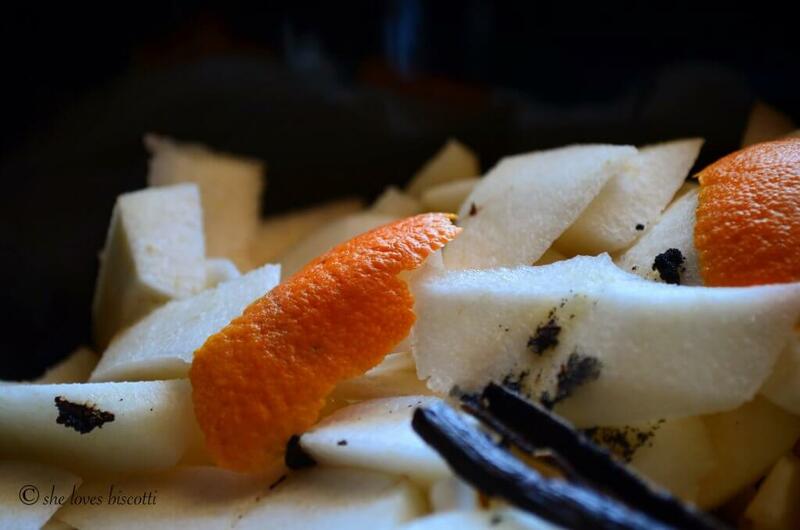 When the pears have softened, remove the vanilla bean and the orange zest. With a hand help immersion blender, process the pears until smooth. Alternatively, the cooked pears can be transferred to a food processor, pureed and transferred back to the slow cooker. Set the slow cooker on low and cook for an additional 6-8 hours. The total time will depend on the total moisture of the fruit. The pear butter is done when there is no liquid that seeps out when a teaspoon of the butter is placed on a dish. Ladle the pear butter into sterile canning jars. Always leave about ¼ inch of head space. Try to remove as many air bubbles as possible. Seal with sterile lids and rings. Remove jars from the pot. Check the lids by pressing on the center of each seal. If it springs back, the jars need to be refrigerated. Otherwise, they can be stored in a cool dark place for about 1 year. Once the jar is opened, it can be stored for about 3 weeks in the refrigerator. To freeze the pear butter: Allow the pear butter to cool to room temperature; place in containers which are freezer safe (always leave about 1 inch head space) and freeze. They will keep for about 6 months in the freezer. Once thawed and opened, they should be stored in the refrigerator. IF YOU ENJOYED THIS PEAR BUTTER RECIPE, SAVE IT FOR LATER. PIN IT TO YOUR PRESERVES BOARD! This recipe is amazing! Question though — mine turned pretty dark instead of staying the light color that yours is. As it cooks in the slow cooker, it gets much darker and looks more like apple butter. It’s fine and still tastes amazing, but I’m wondering how yours is so light? I’m happy to hear you enjoyed the recipe. I think it might be the variety of the pears. I have a Flemish beauty pear tree. Can’t think of anything else that would create a darker color. Amazing! The flabor and the smells pervades the house. My new favorite flavor combination for the fall. Wish I had two crockpots going to make a bigger batch. Also, I saved the crockpot pear juice for a porkchop glaze or ….. Just too good to toss. Thanks for sharing your creativity! I love fruit butters… can’t wait to try this! Hello! I have never worked with canning jars before. Besides your instructions in the recipe do you have a suggested resource for a newbie? I want to make sure I’m doing everything safely. Thanks! Sounds amazing and I’m going to make it! One question, the 2.5 lbs is that Wade after they are chopped peeled and cord? About how many pears is that? Do you have a cups equivalent? Also do you think this could be made in a pot and if so how long on the stove? It is that time of year when pears are everywhere. I want to try your pear butter recipe, however step 5 of your recipe is unclear. Once one is at the stage of transferring the cooked pear in the blender is it not all mixed with the liquid.? 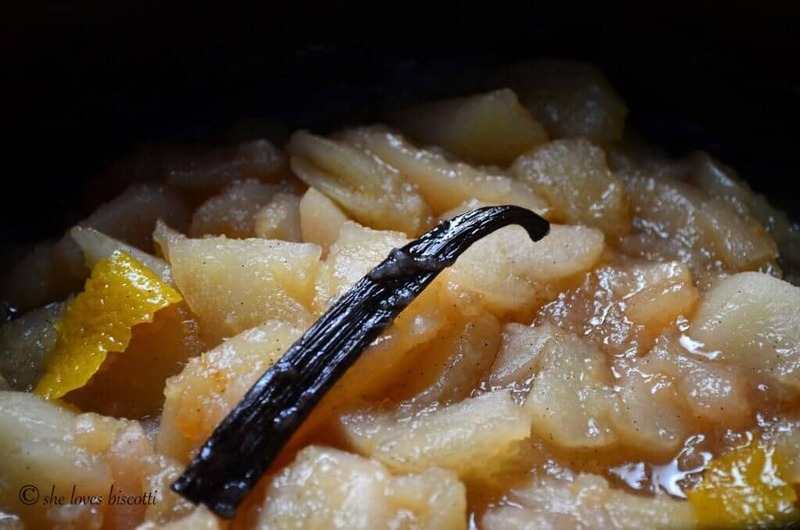 How do you separate the cooked pear from the liquid in the pot? I want to be sure I want to understand the recipe before I start. Hello Lina! The pears should still be more or less intact. If you transfer the pears to your blender with a slotted spoon, the excess liquid will be left behind. The consistency of the pear butter will depend on the amount of liquid added. You will see, you don’t need to add any liquid. You are going to love this my friend. Let me know if you have any other concerns ♥♥♥ Great comment. Will update the recipe to make it more clear. I would like to make this recipe. But I don’t want to process it. If l hand out as gifts right away will it still keep for 3 weeks. Can you substitute vanilla bean extract for the whole vanilla bean? Could this recipe be doubled? I’m so excited to make it, and am planning on giving as gifts. What varietal is your pear tree? Can you use plain old Bartlett pears or do they get too mushy? 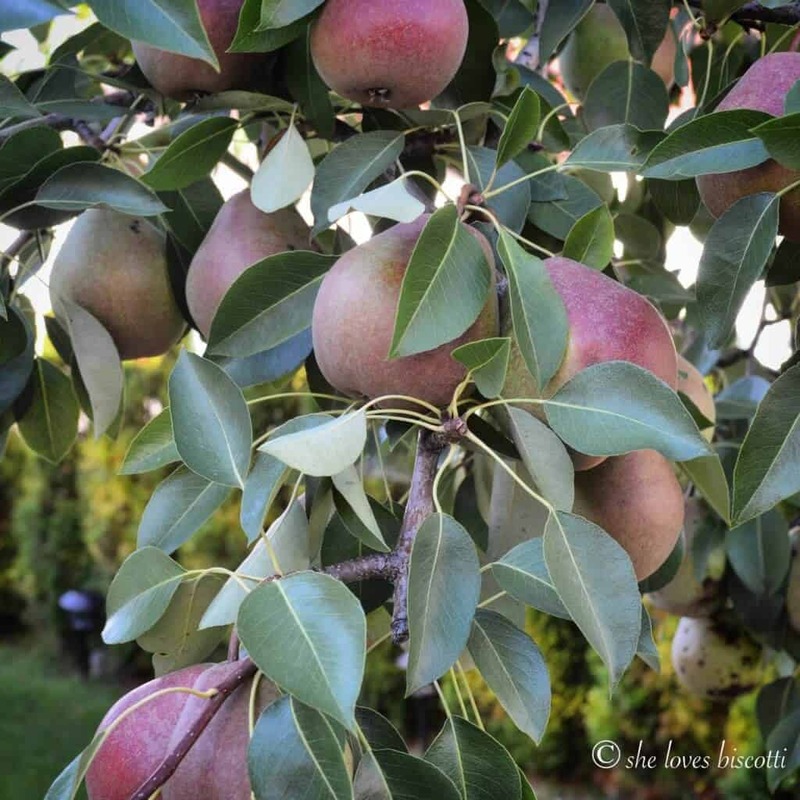 Should I use a winter pear like a Bosc or Anjou instead? Unfortunately, we don’t have a pear tree but our farmers market is awash in Bartletts now and the winter pears are coming soon. Thanks! My backyard pear variety is a Flemish Beauty. 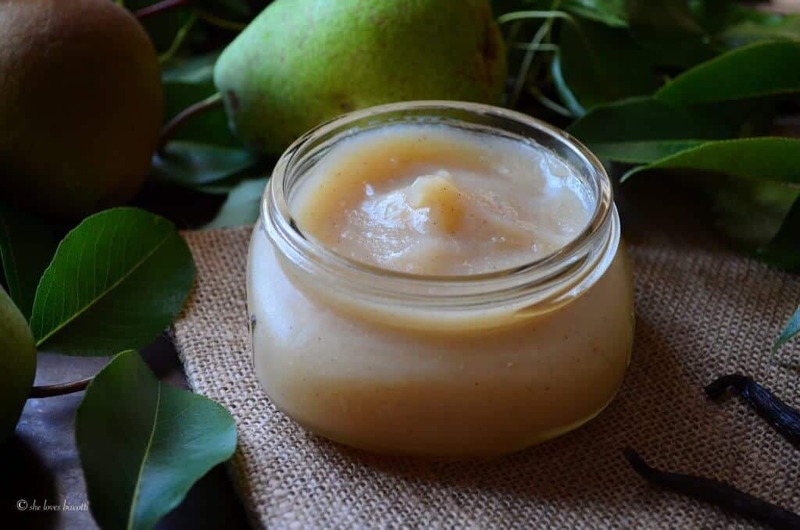 Any variety of pears can be made into pear butter. In fact, Bartlett pears make the best pear butter. As a general rule,the cooking time will vary based on the texture and juiciness of the pear. So, I would keep on eye on them to make sure they don’t fall apart in the crock pot. Make sure to transfer to your blender to process (without the cooking liquid) as soon as they have softened. Have fun making the pear butter 🙂 Thanks for dropping by! I am trying this for the first time. When using the vanilla bean, I scraped the seeds and added them to the recipe and also added the husk. I was unsure wHether to use them both or just the seeds. At the beginning of the process, you can include the whole vanilla bean. When the pears have softened (after a couple of hours) you can remove the husk. This sounds amazing! I’m obsessed with pear right now! I once made a pear and vanilla bean jam, so this sounds like the perfect recipe for extra pears! Oh my, this is right up my alley. Love breakfast and nothing is better than home-made fruit butters with home-made bread and my dippy eggs. Love this flavor combination and so jealous of that beautiful pear tree! Nice job!